The first quarterback selected in the 1968 NFL Draft, Landry was chosen 11th overall after a stellar career at the University of Massachusetts where he was selected All-Yankee Conference for two seasons. He played 15 seasons in the NFL with the Lions (1968-‘78), Colts (1979-‘81) and Bears (1984). 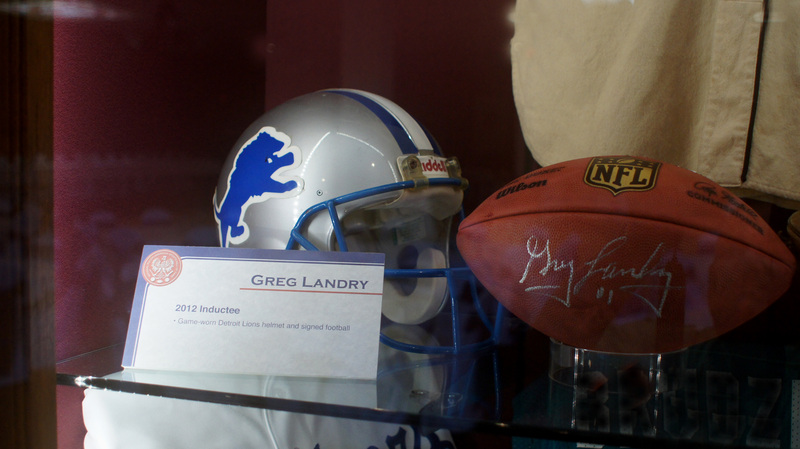 Landry set numerous passing records with the Lions and was named to the Pro Bowl in 1971. He was also notable as a rusher with over 2600 yards and 21 touchdowns in his career. In 1976 he was named the NFL Comeback Player of the Year. After his playing days, Landry coached in the NFL first with the Browns in 1985 and then the Bears where he was the offensive coordinator from 1988-’92. In 1993 and 1994 he was the offensive coordinator at the University of Illinois and finished his coaching career with the Lions in 1995 and 1996. Greg Landry’s long journey in a pro football career that gained him honors and respect as a quarterback and assistant coach began with a ride he hitched from Chicago to Detroit. It was the late summer of 1968, and Landry and fellow Detroit Lions teammate Charlie Sanders had just played in the College All Star Game in Chicago. The annual event, which was discontinued after the 1976 seasons, pitted the top rookies against the reigning NFL champs. Although the college stars came out on the short end of a 34-17 score against the reigning Super Bowl champion Green Bay Packers in 1968, Landry’s performance drew good reviews. He threw a touchdown pass to Earl McCullough in the fourth quarter. Landry, Sanders and McCullough were members of the Lions’ 1968 draft class. After the game, Landry needed a ride to Detroit to report to training camp. “He didn’t even own a car,” Sanders said recently, laughing. “I had to drive him home to Detroit. Whatever method of transportation landed Landry in Detroit, he was much ballyhooed as the Lions’ first-round draft pick out of Massachusetts. Landry launched a stellar 15-season career in the NFL, and two more seasons in the old USFL. Landry and Sanders formed a potent quarterback-tight end combination and developed an enduring friendship. Sanders is giving Landry’s introduction speech at the National Polish-American Sports Hall of Fame banquet. Sanders retired after the 1977 season as the leading receiver in Lions history. 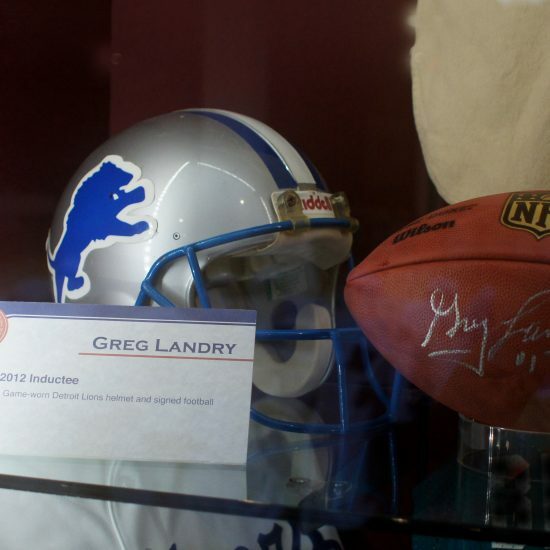 Landry played 11 seasons with the Lions (1968-78) before being traded to the Baltimore Colts after the 1978 season. Landry spent three seasons with the Colts. In 1979, injuries made him a full-time starter on a dreadful Colts team. Landry was one of the few bright spots, with 15 TD passes against 15 interceptions, and was voted the team’s Most Valuable Player. After a one-year retirement in 1982, he came back to play in the USFL – the Chicago Blitz in 1983 and the Arizona Wranglers in ’84 – before retiring again. Once again, he answered the call to arms for one last fling. Late in the 1984 NFL season, the Chicago Bears ran into injuries at quarterback and signed Landry. He started one game – ironically, a 30-13 win over the Lions at the old Pontiac Silverdome in the final game of the season. Landry remained with the Bears through the playoffs, then retired for good and turned to coaching. He had stints in the NFL as an assistant coach with the Browns, Bears and Lions, and also spent two seasons as offensive coordinator at the University of Illinois. Landry lives in the Detroit suburb of Troy and works as a manufacturer’s representative. He and his wife Jeannine, a two-time All-American at Massachusetts in gymnastics, have five children – all college graduates. Landry played in an era when the rules didn’t give quarterbacks anything close to the protection they currently enjoy. Quarterbacks were fair game in and out of the pocket – and sometimes out of bounds. Landry played hard and was hit hard and often injured. He never backed down. In many ways, he was the prototype of what NFL franchises currently look for in quarterbacks. He was a pocket passer with the ability to escape the rush and run. “He wasn’t just fast, he was strong,” Sanders said. “He was physically tough. He really was a pocket passer. Landry got his share of honors, but one singular distinction stands out. Landry made the Pro Bowl for his performance in the 1971 season, making him the only Lions quarterback since Bobby Layne to play in the NFL’s annual all-star game. Landry has some bookend memories to his career. Because of an injury to Bill Munson, Landry started his first game as a rookie in 1968 – a 59-13 loss at Dallas. He also remembers a highlight from his last game against the Lions 16 years later. He was two days short of his 38th birthday on that day, and his body was telling him that there would be no more comebacks. He made a swift transition to coaching, and continued in that role for 12 years. His final year as a coach was with the Lions in 1996. Landry, now 65, grew up in New Hampshire. He grandparents emigrated from Poland. His mother, Felixa “Fannie” Worsowicz, was born in the United States. She is 91 and living in New Hampshire. Landry had many individual highlights in his career. He passed for 16,052 yards and 98 touchdowns in the NFL and ran for another 2,655 yards and 21 TDs. In his Pro Bowl season of 1971, he threw for 2,237 yards and 16 Touchdowns and rushed for 530 yards and three scores. In 1972, he had 18 TD passes, 524 yards rushing and nine TDs. Those stats were compiled in 14-game seasons. Landry had numerous battles for the starting job in Detroit, but he made his mark from the mid-1969 season through 1972. He was healthy and entrenched as the No. 1 quarterback. In that span, Landry had a 25-14 won-lost record as a starter with two ties. Joe Schmidt, a Hall of Fame middle linebacker on the Lions’ championship teams of the 1950s, was the head coach, and the roster was stocked with good, young players such as Sanders, Landry, Steve Owens, Mel Farr, Lem Barney, Paul Naumoff and Ed Flanagan. In 1970, the Lions caught fire and won their last five games for a 10-4 record and a playoff berth with Landry directing the team. The Lions lost to the Cowboys, 5-0, in the playoff game. With his size (6-4, 210 pounds), strong arm and running ability, Landry was an impressive athlete at the quarterback position. “The period that stands out most is the period from ’70, ‘71 and ‘72,” Landry says now. “We were in the playoffs in 1970, and in ’71 and ’72 we got snake bit with the Minnesota Vikings, but I think we maybe were just a player or two short of going back (to the playoffs). Landry’s running made him a dangerous threat. He had a signal with center Ed Flanagan, another consistent Pro Bowler, for a quarterback keeper when Landry saw the defense in a vulnerable formation. “If I felt I could quarterback sneak, I’d pat him on rear end,” Landry said. “He’d block the first guy, and I’d take it up into the secondary. Landry had a 76-yard touchdown run in 1970 and a 52-yard run in ’71. 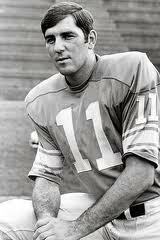 His style reminded people of the late Don Meredith, the quarterback of the Dallas Cowboys. In fact, one of the highest compliments Landry received came when Dandy Don once said that Landry reminded him of himself. Injuries began to hit Landry, and they hit hard. From 1973-75, he played only 18 of a possible 42 games with just 13 starts. He recovered in 1976 to play all 14 games and have one of his best seasons, with 17 TD passes, eight interceptions and 234 yards rushing. He was voted the NFL’s Comeback Player of the Year. “It proved in my mind that I could play at a high level in the NFL,” Landry says now.